With just a few days until I move away, I've been trying to do things and go places I haven't been before. On Saturday, I learned that some stones are better left unturned. 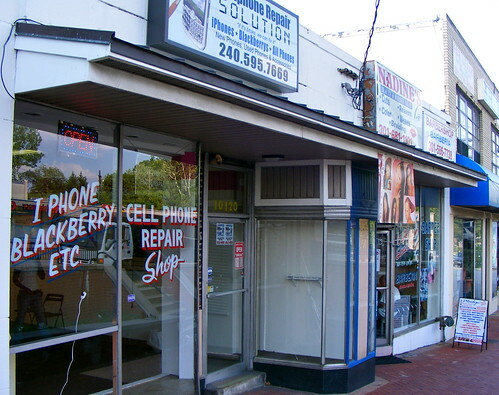 One of them is Cellphone Repair Solution, located on Colesville Road at University Boulevard in Four Corners. Colesville Road in Four Corners has to do double duty. It's a state highway that passes through a neighborhood shopping district, and it's obvious that the highway won out. The stores lining it - a Peruvian restaurant, a couple of hair salons, a check-cashing place, a bar - were probably at street level many decades ago. Today, they and the sidewalk are sunk below the road. 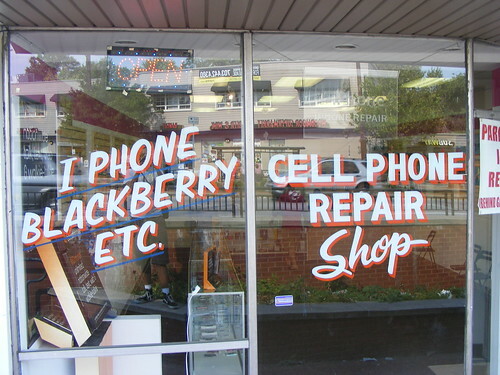 I drive past this block almost every day and have never stopped in, but I've long admired the painted windows at Cellphone Repair Solution. Painted windows aren't unusual around here - the ones on Telvis Restaurant and Bar in Wheaton are probably my favorites - but they seem ironic for a store devoted to modern technology. On Saturday, I stopped by to take a photo of the sign. While standing outside the store, I was approached by a African man in a Diesel shirt. Not surprisingly, he was waving an iPhone. "What is this about?" he demanded. "What is this picture for?" "I like your sign," I replied. I tried to explain that I thought it was ironic, but he wasn't buying it. "Did you ask permission?" he barked. No, I said. I don't have to. "Taking photos is protected free speech." "Whether or not it's free speech," he said, "You can't come into private property and take photos without asking permission," the man responded. The public sidewalk in question. "I never went into your store," I said, "and I'm standing on a public sidewalk." "This is not a public sidewalk," he replied. He continued to argue with me before I cut him off. 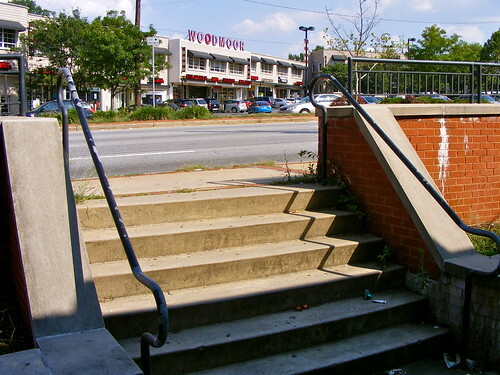 "This is a public sidewalk. Taking photos is protected free speech. You do not have a case, sir," I said, before I walked away. The man followed me to my car, blabbing away on his phone about how he has to "take care of me." He watched me from the public sidewalk as I pulled out onto Colesville Road. "Have a nice day!" I called out to him. The store in question. Do not bring your business here. "The general rule in the United States is that anyone may take photographs of whatever they want when they are in a public place or places where they have permission to take photographs. Absent a specific legal prohibition such as a statute or ordinance, you are legally entitled to take photographs. 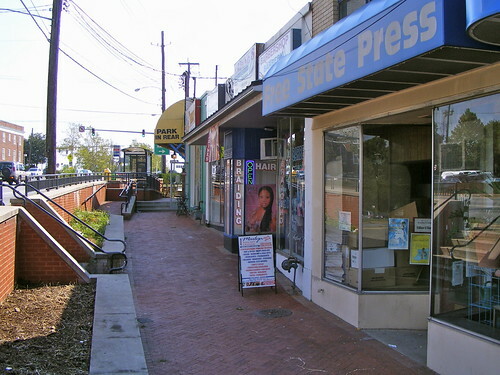 Examples of places that are traditionally considered public are streets, sidewalks, and public parks." I was standing on a sidewalk the whole time, meaning I had the right to photograph this shopkeeper's window. Unfortunately, I could've just taken the photo and written a nice post about a quirky sign. Now, I'm going to tell you not to patronize this man's shop. From the way he spoke to me, I can't imagine how he must treat his customers. After all, he couldn't even get off the phone to yell at me. Perhaps a group of photographers should show up at this business, say at noon this Saturday, and take photos?! Out of curiosity, are you positive the man in question actually worked at the store and wasn't some random person who didn't want his own picture or something else in the area photographed?